Pitter-patter goes my heart in response to the beyond delicious concoctions of the new Spring/Summer 2010 collection from Misha Lulu. I’ve been a steadfast and dedicated fan of Misha Lulu since 2007 when I first discovered the US label. The quality is top notch and the designs are second to none. They created my daughter’s favourite dress of all time and as she grew, it transformed from a dress into a treasured blouse. Misha Lulu has a true retro-modern aesthetic that seems to get better and better with each passing season. The newest collection is no exception with its four distinct design themes: ‘Swimmer‘ for all things aquatic with a whimsical and retro flair; ‘Fresh Baked‘ centres around sweet, almost edible colours with scrumptious cupcakes; ‘Homegrown‘ is all about gorgeous vegies and fruit with a message of being eco-conscious; and ‘Blue Bird‘ features soft, pastel shades mixed with splashes of bright with blue the predominant colour. 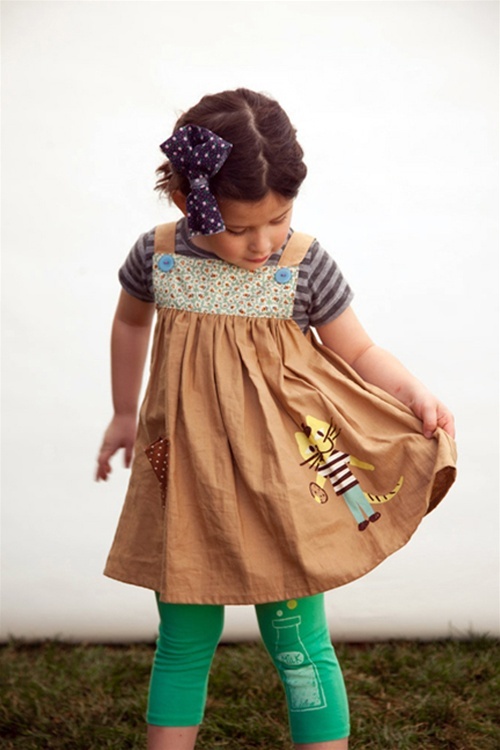 To add one of Misha Lulu’s stunning made-in-the-USA pieces to your little girl’s wardrobe, head to US shop Arte Bebé. Prices range from US$28 to US$66 plus postage to Australia. Art Bebé are offering all international customers free shipping when you spend $125 or more on clothing. The code is GLOBAL125 when you check out and is valid until the end of June.